The horrendous trade in Albino body parts in East Africa. A young albino woman has spoken of the 'indescribable' pain which coursed through her body the moment a gang of men hacked off her arm - because they believed her albino skin would bring them wealth and luck. Kulwa Lusana was just a teenager when the five men held her down and attacked her with machetes as she lay in bed at her home in north-west Tanzania, before bundling her arm into one of their coats and running off into the night. 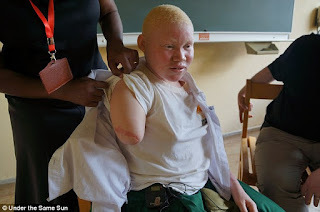 Shockingly, Kulwa was lucky: she is one of hundreds of victims of the sickening trade in albino body parts, used in potions mixed by so-called witch doctors for the rich and powerful. My latest book, The Red Trade touches on this disturbing and disgusting practice, hopefully it may raise a little awareness, even if in a very small way.